Although “premium” snacks are provided for free on our flight to Japan (which includes fresh fruit – yeah! 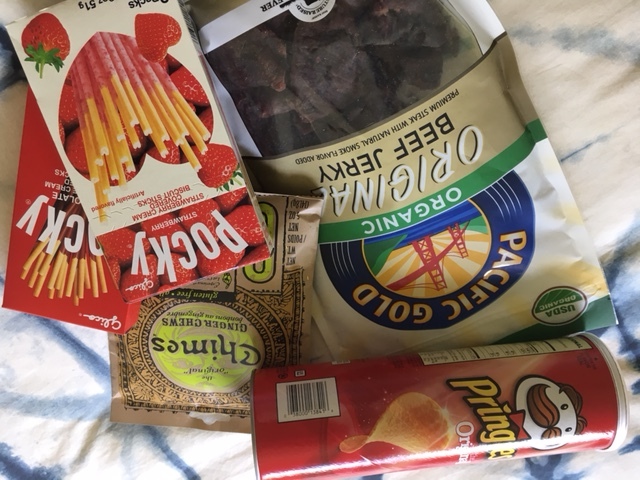 ), we’re still packing our own snacks for airport layovers and the long train ride into Tokyo: beef jerky, Chimes ginger chews, Pringles for Brett and YaYu (less messy than regular chips), and Pockys (pronounced poke-y) for YaYu. We’re bringing along an empty stainless steel water bottle and will fill it with filtered water for free at the Honolulu airport rather than buy expensive bottled water. By watching fares and being ready to buy early, we got the lowest price for our RT flights to Japan and back, saving 2/3 of what it would have cost to purchase the same premium economy seats the past couple of months. We’d been talking about adding Hulu to our streaming services as we’re running out of shows we like on Amazon and Netflix, so this past week I signed up through Swagbucks and earned an additional 2,500 points, or $25 in Amazon credit. We’re going to try Hulu for three months ($23.97) and see how we like it, and if we don’t use it that much we’ll cancel. This past week we ate up all the leftovers and produce, and don’t have to throw anything out before we leave this morning. All that’s left in the fridge are condiments and a jar of peanut butter. We’re looking forward to a fun and frugal time in Japan. I’ll try to post a couple of times while we’re there, but otherwise, I’ll be back in a couple of weeks! Thank, Kris! We love coming back here, and are having the best time with M & family. M is on vacation this week, so goes out with us every day (which has been a BIG help). Have a wonderful trip! Enjoy the time with your family. Can’t wait to hear all about it! Safe travels!